SmartCentres® has partnered with Simon Property Group, a global leader in retail real estate property. 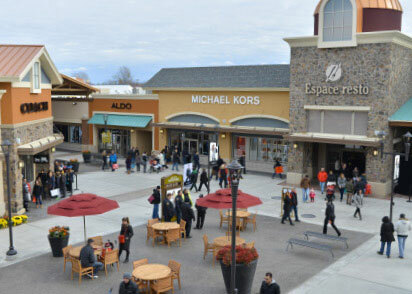 Toronto Premium Outlets® serves a market of six million people. Premium Outlets® Montréal opened Autumn 2014 boasting several first-to-Canada discount outlets including Max Mara and Famous Footwear. 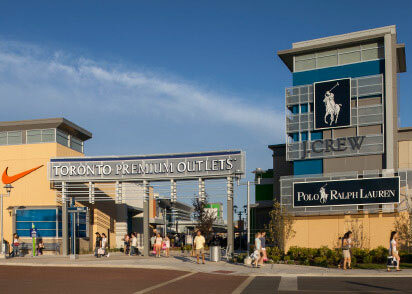 In 2012, SmartCentres took a major step forward by partnering with Simon Property Group Inc., the largest real estate company in the world, to open Canada’s first Premium Outlets® Centre in Halton Hills, in the Greater Toronto Area. Opened in August 2013, this new, 360,000 sq. ft. complex features more than 100 top retailers including Ralph Lauren, J. Crew, Brooks Brothers, Calvin Klein, Coach and many more. With six million people living within a one-hour drive of the complex, it experienced record-breaking traffic within the first few months of opening, and is currently undergoing an expansion to over 500,000 sq. ft., scheduled to open in November 2018. Building on the momentum from the Toronto opening, the SmartCentres-Simon alliance opened Premium Outlets® Montréal in October 2014. With 360,000 sq. ft. of retail space comprising 80 stores, the complex services over four million people in the Greater Montréal trade area. Like its Toronto sister, the Montréal complex features an unparalleled mix of leading designers and international name brands including Ferragamo, Tory Burch, and the only Gucci outlet in Canada. Not only is it a great opportunity for Montréal area consumers and tourists to shop at many of the finest retailers in the world, it brings significant economic benefits to the immediate community as well. The SmartCentres-Simon alliance is itself a perfect combination of competencies. Brought together, SmartCentres’ strong domestic presence and Simon Property Group’s global retail experience, will help to further expand and evolve the retail real estate industry in Canada.